This book was referenced in so many other stuff I was reading, so I finally bought and read it. 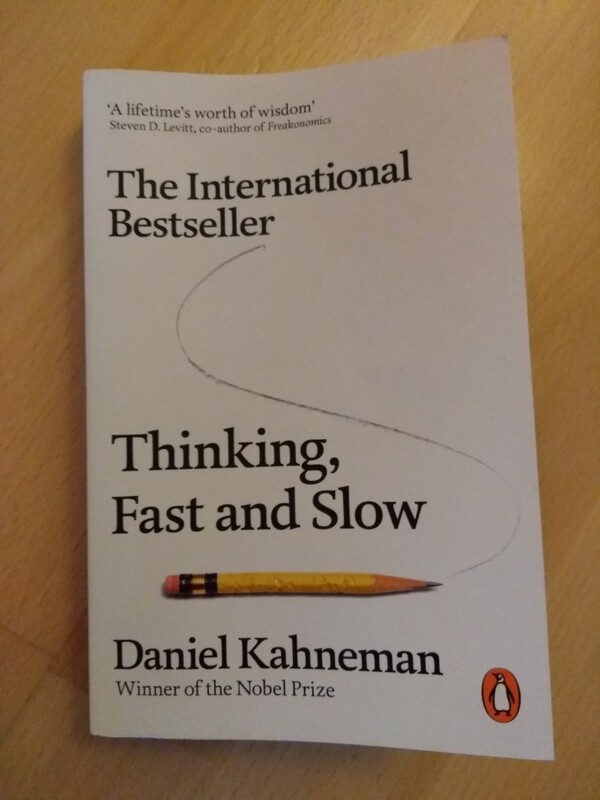 The premise of Kahneman's book is that there are two different modes of thinking: a faster, low-energy, intuitive mode, and a slower, high-energy, rational mode. The fast mode is best at basic cognitive stuff, like driving a car on an empty road and reading traffic signs, while the slow mode is essential for non-trivial stuff, like parallel parking or multiplying large numbers. The fast mode is generally used over the slow mode, simply because it consumes less energy. 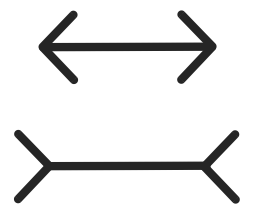 Fast mode being the default mode can be problematic because it easily leads to wrong conclusions, a popular example is the Müller-Lyer-Illusion, where two lines of the same length are considered to be of different length. Fast mode is also the fallback or "eco" mode: Imagine solving a complex problem at work, a slow mode activity - afterwards you will feel drained, and you are forced into fast mode because there is no energy left. You will have less self-control, will be easily annoyed or might say things you wouldn't say otherwise: This is what Kahneman calls Ego Depletion. Priming - decisions can be easily influenced by a given context. For example, given the word "eat", the word "so_p" is more likely to be interpreted as "soup" rather than "soap". Halo Effect - imagine a teacher grading a student who has performed well in the past more favorably than someone who has not. You will also favor job interviewees who leave a good first impression. Cognitive Ease - we are easily convinced by things that are understandable or sound familiar. This explains why living in filter bubbles is so comfortable and Fake News is on the rise. Framing - different ways of presenting identical information - for example advertising food by saying it has 10% fat versus saying it is 90% fat-free. The latter sounds way better. Substitution - not answering a difficult question, but answering a simple question instead and considering them equal. For example, people are likely to vote for political candidates who just look like typical leaders. Kahneman continues to explain how easily wrong decisions are made on the basis of questionable heuristics and cognitive biases. Small Numbers - a small sample size will lead to extreme results. Kahneman shows how increased cancer rates are more likely in small counties, not because there are fewer doctors or hospitals, but just because the sample size is smaller. Anchoring - the answer to a question is usually close to an initial suggestion. In a salary negotiation the initial offer is usually low (if it's too low one should directly abort negotiations to get rid of the anchor). Availability - for example overestimating the risk of a terrorist attack simply because there is lots of news coverage about terrorism. Regression to the mean - an observation like "depressed children treated with an energy drink improve significantly over time" is actually valid - but only because their level of depression was extreme and they are more likely to return to a normal level. Hindsight - for example believing in a success story without considering luck - they are called "stories" for a reason. Kahneman debunks books like Good To Great that describe what successful companies have in common, without looking at the ones that failed (usually the successful and unsuccessful are all alike). Illusion Of Validity - for example believing you are a great trader just because you can come up with a recipe for success based on your latest investments. In chaotic environments like the stock market it mostly comes down to luck. Intuitive Experts - Kahneman admits there is such a thing, but only under specific circumstances like having invested 10,000+ hours in a domain. Usually algorithms and formulas are making better predictions than experts. Planning Fallacy - it's easy to ignore competitors or disregard previous experience. And even a well-made plan seldom accounts for "unknown unknowns". Sunk-Cost Fallacy - for example investing in a dropping stock over and over again, to neutralize losses and avoiding regret. It's better to sell losing stocks and keep winners. This is the field where Kahneman won the Nobel prize in 2002. He basically debunks most of Economics, which used to model human behaviour as solely rational. I have written about similar things in my review of Animal Spirits. 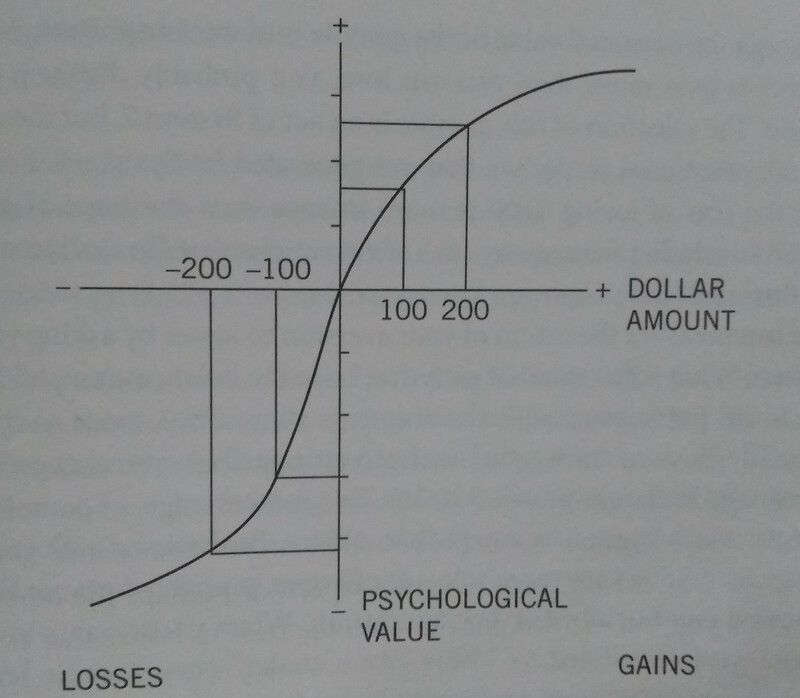 In contrast to the concept of Expected Value, Prospect Theory states that value is not linear but an asymmetric curve, that is more sensitive to losses than gains. I still remember being taught Expected Value theory in my Economics classes at the University - it felt overly simplified then and this is why. The right-hand side can be explained by looking at similar data in a table. The reference point (being rich or poor) was totally ignored in previous theories. I liked how Kahneman uses this to explain why insurances are sold by rich people to poor people: In low probability scenarios with high losses actors are risk averse, this is why poor people pay premium to transfer the risk to rich people. Loss Aversion is also a core finding of Prospect Theory. Actors would rather not lose $10 than earning $10. In the following table Kahneman identifies four scenarios that explain when actors are risk seeking and when risk averse. The Certainty Effect describes that people are willing to pay to reduce risk in the context of high probability winnings - actors rather choose a 100% chance to win $10,000 than a 95% chance to win $12,000. In the context of losses actors are risk seeking - imagine owning a stock that has decreased significantly in value: you will try hard to avoid losses are willing to buy over and over again to lower your overall price. The Possibility Effect can best be described as a lottery ticket in the gains scenario: Actors are willing to pay just to have a chance to win a large price. The experienced value increase from a 0% to a 1% chance of winning is a lot higher than an increase from 1% to 2%. In the losses scenario, people are again risk averse, this is the "buying insurance" scenario. Another interesting finding - it describes that people are rating things they own with a higher value than things they do not own. If you wanted to see your favourite musician perform, and tickets cost $100, you would for example be willing to pay $200, but would only be willing to sell for a value of, say, $1000. There is also a famous experiment where people are randomly given a chocolate bar or a coffee mug, and are later offered to exchange the gift for the other. A huge majority sticks with the gift they were given in the first place. For me it was fascinating to see how easily poor decisions are made. It helps to understand that, while fast mode offers significant upsides like conserving energy, it is also insufficient to solve complex problems that are more frequent today - the number of simple jobs is simply shrinking, and most jobs that could be done by fast mode are now done by machines. Although fast mode is genius because of its simplicity, I argue that you need slow mode more than ever today. The other major takeaway for me was to be more careful with the energy I expend. It's essential to avoid Ego Depletion and I would rather work less than make poor decisions. I think meditation is also helpful to identify when you are switching from fast mode to slow mode and back. My hope is that with some training I can become more aware of the mode I'm currently in. I guess the knowledge about the different modes will help me to be more compassionate with fellow human beings in the long run. Face it, almost everyone will never care about their current mode. So I will try to be more patient, taking the steam out of heated discussions, allowing for pauses and breaks, and making sure there is enough energy in everyone to allow for a rational dialogue.